Abstract. 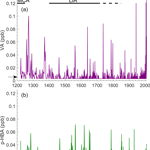 This study presents vanillic acid and para-hydroxybenzoic acid levels in an Arctic ice core from Lomonosovfonna, Svalbard covering the past 800 years. These aromatic acids are likely derived from lignin combustion in wildfires and long-range aerosol transport. Vanillic and para-hydroxybenzoic acid are present throughout the ice core, confirming that these compounds are preserved on millennial timescales. 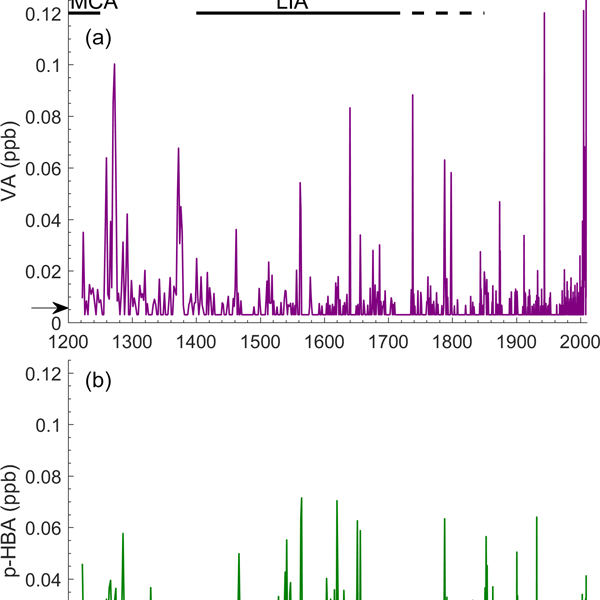 Vanillic and para-hydroxybenzoic acid concentrations in the Lomonosovfonna ice core ranged from below the limits of detection to 0.2 and 0.07 ppb, respectively (1 ppb  =  1000 ng L−1). Vanillic acid levels are high (maximum of 0.1 ppb) from 1200 to 1400 CE, then gradually decline into the twentieth century. The largest peak in the vanillic acid in the record occurs from 2000 to 2008 CE. In the para-hydrobenzoic acid record, there are three centennial-scale peaks around 1300, 1550, and 1650 CE superimposed on a long-term decline in the baseline levels throughout the record. Ten-day air mass back trajectories for a decade of fire seasons (March–November, 2006–2015) indicate that Siberia and Europe are the principle modern source regions for wildfire emissions reaching the Lomonosovfonna site. The Lomonosovfonna data are similar to those from the Eurasian Arctic Akademii Nauk ice core during the early part of the record (1220–1400 CE), but the two ice cores diverge markedly after 1400 CE. This coincides with a shift in North Atlantic climate marked by a change of the North Atlantic Oscillation from a positive to a more negative state. How to cite: Grieman, M. M., Aydin, M., Isaksson, E., Schwikowski, M., and Saltzman, E. S.: Aromatic acids in an Arctic ice core from Svalbard: a proxy record of biomass burning, Clim. Past, 14, 637-651, https://doi.org/10.5194/cp-14-637-2018, 2018.